Watch Video Tutorials to Learn what all features are offered by Auto Clicker. The Video Tutorials have been Recorded on a Windows 10 Computer, however all the features of this Software do work in Windows 7 and Later Versions. Download Latest Version of Auto Clicker to Enjoy Automated Mouse Clicking. Various features of Auto Clicker are available in the Right Click Menu of the Software. When you Right Click on the Main Screen of the Software, you are presented with a Menu from which you can launch any appropriate feature of the Software. Download All Tutorials in a single .zip File OR Click on any of the Given below Tutorial Link to Watch the Video Tutorial in Windows Media Player or default Video Player Configured to play .wmv file. You can Alternatively Download any of the given below Video Tutorials by doing a Right Click on the Tutorial Link and then by Clicking on Save Target as in Internet Explorer or by Clicking on Save link as in Google Chrome. Watch a Short Feature Tour of Auto Clicker to View all the Features offered. Learn How you can Assign a Keyboard Shortcut to Start / Stop Automatic Mouse Clicking. Watch how you can Enable Random Time Delay between Automated Mouse Clicking. Understand how you can Automate Mouse Clicking at Random Screen Locations around current Mouse Cursor Position or around Fixed Screen Location. Launch Single Or Multiple Auto Clickers with Individual Settings. 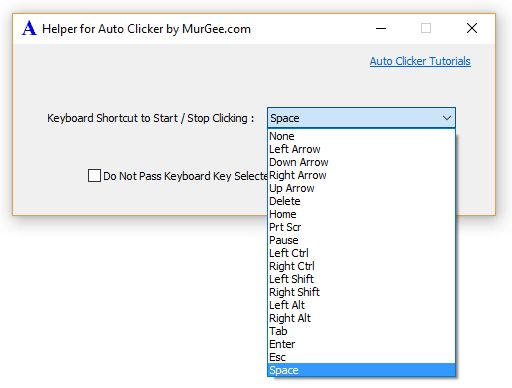 Learn How you can Use Auto Clicker without a Keyboard Shortcut and use Mouse Click to Start / Stop Clicking of Auto Clicker. Auto Click at Fixed Screen Location with Configurable Keyboard Shortcut from Right Click Menu of Auto Clicker. 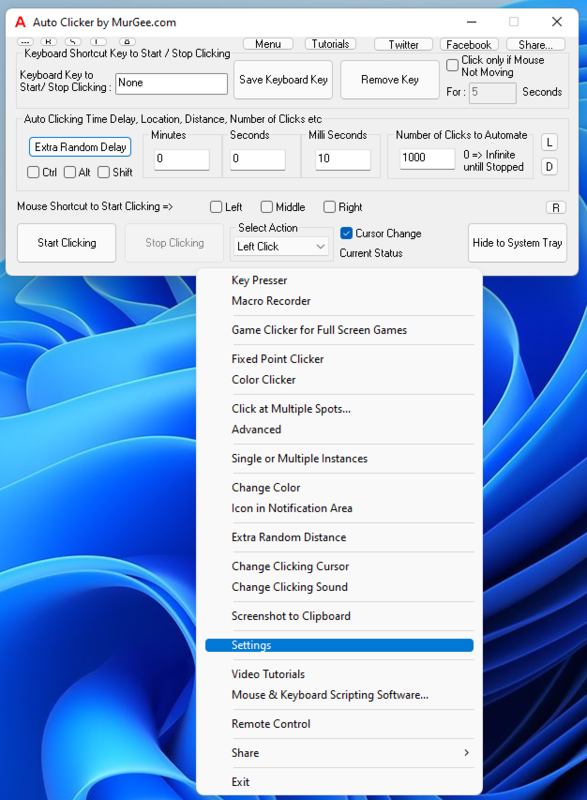 Key Presser from Right Click Menu of Auto Clicker to Automatically Press Selected Keyboard Key. Use Macro Recorder to Record and Replay Left, Middle and Right Mouse Buttons to Automate Mouse Click, Double Click, Mouse Dragging, etc. Use Game Clicker to Play Full Screen or Direct X Games. The Tutorial Displays How to Install and Configure the Game Clicker. Watch Introduction of Advanced Clicker to Auto Click at Multiple Screen Location with single Keyboard Shortcut. Auto Click with Keypress to Click as long as a Keyboard Shortcut is pressed. You would need to Download Additional Auto Clicker Component to Auto Click by Holding a Keyboard Key Down. You can press Left, Middle and Right Mouse Buttons with this Key Holder Auto Clicker. You can also Download Auto Clicker Tutorial as a PDF File which explains lots of features of the Auto Clicker in a Step by Step Manner. Download Additional Auto Clicker Drivers to use for Clicking in Direct-X and Full Screen Games. Make sure to Install the Correct Version as per your Operating System Bit Architechture and Operating System Version. In case you do have doubts, please write to Support@MurGee.com with your Operating System Version, Bit Architecture and inform whether you have HID Mouse or PS2 Mouse as per your Device Manager. Download Additional Auto Clicker Component to do Mouse Clicking as Long as you press a Keyboard Key. Note that Mouse Clicking done by this Additional Component would be at current Mouse Cursor Location. Download Helper Application for Auto Clicker and Start / Stop Automated Mouse Clicking with Keyboard Keys like Ctrl, Shift, Alt, Tab, Arrow Keys, Spacebar, etc. You can also View another Software Titled Auto Mouse Click which works in Games, Websites and everything else. You can also watch Video Tutorials for Auto Mouse Click Utility which displays various features of the Software.